Through the history of Western Classical music women have been dramatically underrepresented: consider that the Vienna Philharmonic Orchestra has only been integrated from a gender standpoint for a whopping fifteen years. As far as composers go, historical surveys generally include but a handful—usually starting with Hildegard, maybe Barbara Strozzi, then skipping to Fanny Mendelssohn and Clara Schumann, and finally mentioning Ruth Crawford Seeger and Sofia Gubaidulina. Even though there are some historico-sociological reasons for this paucity (especially in terms of access to education and the “moral suitability” for women to dedicate themselves to a performing career), the attitude towards female musicians and composers has only begun to change slightly in the past few decades. [For an illuminating read on this subject, I heartily recommend Marcia Citron’s Gender and the Musical Canon]. Women guitarist, in particular, suffer from a kinf of double bind: the instrument, considered too “effemminate” for a gentleman, was at the same time too sultry for a proper lady (the lute was the more appropriate choice). In the twentieth century, the guitar struggled at the edge of instrumental historiography and musicology, not worthy of the same attention of the violin or piano. 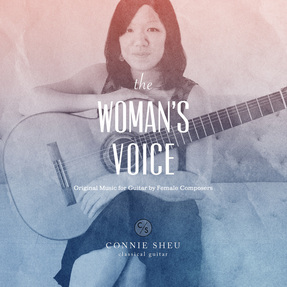 Again, things have been lightening up considerably, and a program such as the one recorded by Connie Sheu on this album, which focuses entirely on four female guitarist-composers, is not as subversive as it might have been in the past. But enough with this post-modern psycho-babble on gender and canons: let’s move on to the music. First on the disc are seven selections by Emilia Giuliani (daughter of a certain Mauro, who I’m told used to play guitar quite well): a theme and variations clearly reflecting her father’s bel canto-inspired style, followed by a set of “Sei Preludi” which foreshadow much more adventurous harmonic directions (and thus more in sync with contemporary musical trends). Canadian-born Dale Kavanagh’s Three Preludes provide a distinct compositional contrast to her predecessor: albeit at times a bit monothematic, her composition explore a much broader range of the instrument, often esplicitly evoking (with their titles or idiomatic writing) classics of the repertoire by Britten and Turina. Continuing on the modern trend, Segovia by Ida Presti was successful in alluding to the styles of some of the composers associated with the Spanish Maestro — I hear some of Torroba’s trademark rhythmic and melodic turns, and pentatonic passages that could have been penned by Tansman. Sheu’s elastic phrasing and the warm, lyrical tone she coaxes out of her maple/spruce Byers are the perfect complement to both the music and the style of the musician who inspired it. The shadow of Segovia is conjured once more for the final piece of the disc, a substantial work by Dutch guitarist-composer Annette Kruisbrink (b. 1958). Unlike the Presti piece, her Homenaje to Andrés Segovia departs stylistically from Segovian territory — extended techniques, angular writing, and dark, dissonant harmonies were predominant, creating a mischievous (and exhilarating) atmosphere. Kruisbrink is exceptionally prolific as a composer — this award-winning piece is only one of over two hundred other works, many for different kinds of ensemble combinations. Throughout the disc Sheu performs with authority, sensitivity, and flair, demonstrating the musicianship necessary to back up her programming choices. The recorded sound is clear and open, allowing the playing to come through unhindered while also providing a fair share of aural indulgence. I don’t simply recommend that you check out Connie Sheu’s excellent The Woman’s Voice, but also urge you to accept her implied invitation to explore this seldom-heard side of the repertoire.